In 4-quart saucepan, heat oil over medium heat. Add chicken. Cook 4 to 6 minutes, stirring occasionally, until no longer pink in centre. Stir in onion. Cook 2 to 3 minutes, stirring occasionally, until onion is tender. Stir in broth, water and carrots. Heat to boiling. Cook 5 minutes over medium heat. Stir in broccoli, noodles, basil and garlic-pepper blend. Heat to boiling; reduce heat. Simmer uncovered 8 to 10 minutes, stirring occasionally, until vegetables and noodles are tender. Substitution : You can substitute chicken thighs for part or all of the chicken breasts. Usually, two boneless thighs will equal one breast half. 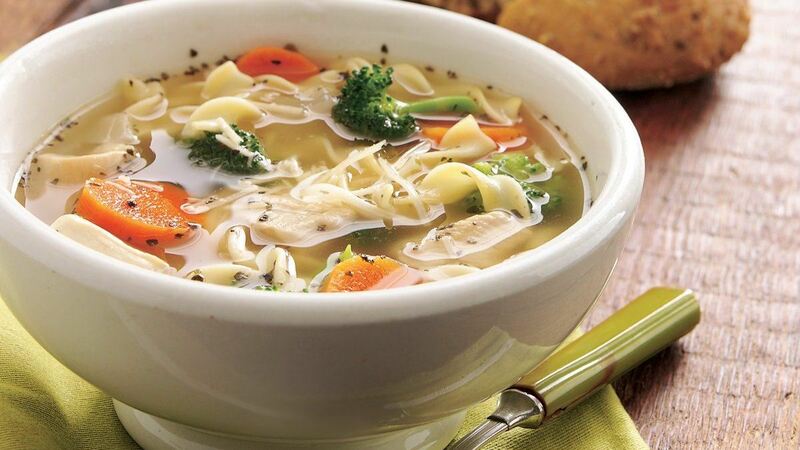 Substitution: Fresh vegetables are used to make this colourful soup, but you could use frozen vegetables if you like.